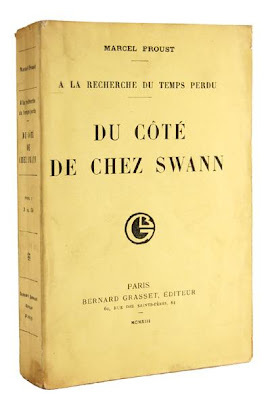 In general it is best to stick to prices charged by French dealers, outside of France dealers tend to overrate these books and fail to understand condition standards and all the different states of the limited editions. Some have limitations as low as 2 or 3 copies, on vellum thick as Mother's Pride. Most book sites will not recognise signed books in French even if you tick the signed box so use words such as 'envoi' or 'envoi de l'auteur' in the keywords section. The other thing to look for with French books, apart from colourful erotica and tomes with illustrations by modern masters such as Picasso, Rouault, Foujita, Man Ray or Braque, is exquisite bindings. Leather bindings that we might regard as very fine and elaborate are, by comparison with French efforts, ordinaire and at best worthy or merely competent. 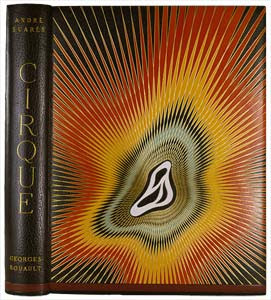 Left is a superb Bonet binding for Cirque an unpublished 1939 work by André Suares with illustrations by Ambroise Vollard. Livres d'Artistes in their elaborate boxes, chemises and slip-cases are another story to be dealt with at another time... The trouble with all this is that these books scream high values--they are very unlikely to show up undervalued. But not impossible. Never forget the wise and stirring words of Cadillac Jack --'anything can be anywhere.' Courage Fuyons! Love both your posts on French books - I collect them and it is an endlessly fascinating subject. Editions printed on grands papiers can often be had for reasonable sums, and the printing is gorgeous. Funnily the regular versions are nearly always flimsy and falling apart. There is no "middle" in French publishing it seems. More articles on this topic, please. A quick thought on the senselessness of signed books.